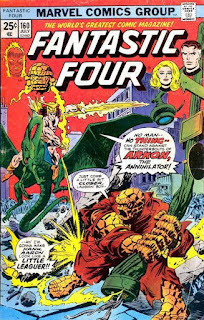 Kleefeld on Comics: On History: Fantastic Four, Inc. The tax advantage that this situation creates comes with the realization that along with a patent of the letter E, Reed Richards obviously has political clout. Lots of political clout. Remember we're talking about a man who was able to swing enough zoning variances to permit jet plane landings, rocket ship take-offs, and nuclear generators in the Baxter Building, a mid-town Manhattan address only a few blocks from the United Nations building. All of that in mid-town Manhattan requires more pull than a Coney Island taffy concession. Reed must have enough connections, that he could get Congress to Vote itself a pay cut. With such pull working for him, Reed would have no trouble in getting the F.F. declared a non-profit organization. As a matter of fact, they are. Check The Amazing Spider-Man #l.